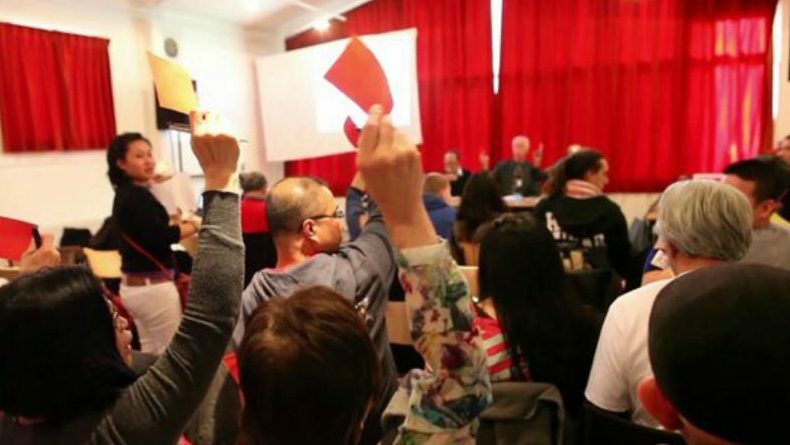 The Netherlands Country Chapter of the International League of Peoples’ Struggle held its Founding Assembly on 14 April 2013 in Amsterdam, The Netherlands. It was attended by 30 participants representing 14 member-organizations and four observers. The programme started with the singing of the ILPS hymn. Theo Droog, member of the ILPS Coordinating Committee, opened the assembly and welcomed the participants. Prof. Jose Maria Sison, Chairperson of the ILPS, gave the keynote address. In his speech, he noted the fact that the Netherlands is a small country but is one of the ten richest countries in the world. Its monopoly corporations in industry, energy, production, finance, and service sectors are among the biggest in the world. He called on the ILPS-Netherlands to hold seminars, conferences and forums concerning vital issues in The Netherlands and in the world. He also called on the chapter to issue statements to declare the stand of the ILPS-Netherlands on issues and propose the necessary and appropriate course of action. Prof. Sison urged the member-organizations to expand their membership and reach out to other progressive organizations to become member-organizations of the ILPS-Netherlands. He called on the chapter to initiate mass actions to protest anti-people policies and make demands. He also urged the chapter to join and cooperate in the good initiatives of progressive organizations in The Netherlands. The assembly discussed and approved the Constitution of the ILPS-Netherlands chapter. The delegates evaluated and approved the application of four organizations. The assembly then welcomed the new member organizations. The assembly then proceeded to discuss and approve the document on the Situation of the Netherlands and the Chapter’s Program of Action, laying down the situation and tasks for the coming two years. The assembly elected a seven-member Country Coordinating Committee. Elected to the committee were Filipino Refugees in the Netherlands (FREN), Kabalikat – Netherlands, Nederlands-Filippijns Solidariteitsbeweging (NFS), Organization of Indonesian Workers – Netherlands (OIWAN), Pinay sa Holland – Gabriela, Samaka – Netherlands, and the Tamil Center for Human Rights (TCHR). Solidarity messages from ILPS member organizations from different parts of the world were read out. Theo Droog closed the Assembly, congratulating the participants for holding a very successful Founding Assembly. During its first meeting, the Country Coordinating Committee elected its officers: Theo Droog (NFS), Chairperson; Indran Chinniah (TCHR), Vice Chairperson; Boyen Baleva (FREN), General Secretary; Ilena Rose Saturay (Samaka-NL), Deputy Secretary General; Nenet de los Santos (Pinay sa Holland), Treasurer; Siswa Santoso (OIWAN), Public Information Officer; and Ronnie Teodosio (Kabalikat NL), Auditor. Founding Assembly International League of Peoples’ Struggle Netherlands Chapter from KODAO Productions [Europe].